When I was 10 years old (in the early to mid nineties) basketball was the biggest thing in the schoolyard. Every second kid had a Chicago Bulls hat and or a Charlotte Hornets jersey… because it didn’t matter about the team or teams you supported; all that mattered was whether or not you had any apparel adorned with that magical NBA logo. Now, we were Aussie kids, so truth be told, we didn’t know too much about the game itself and to be honest all the other faces on our 94’ Fleer Ultra basketball trading cards mattered very little, as very kid knew that only the Michael Jordan cards were the only ones that’d be ‘worth something’ when we grew up! 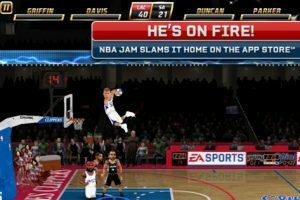 But NBA was everywhere, from the man himself appearing in Looney Tunes films to our ultra rad Super Nintendo’s… and that brings me very neatly to a game that harps back to its 1990’s predecessor, EA sports latest iPhone release, NBA JAM. NBA JAM features old school two on two arcade style basketball action, with 30 official NBA teams and all the stars of the game at your finger tips. You can dive straight in to the easy to master tutorial in ‘play now’ mode or, if you dream of becoming an NBA champion, you can battle through the game’s ‘Classic Campaign’ mode in which you’ll have to face off and defeat every team in the league. This was the path I chose. Playing through the game in its entirety gives you the chance to unlock cheats like the hilarious ‘Big Head mode’ online casino and even gain access to legendary players of the casino game along the way. 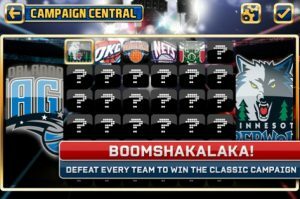 Not to mention the in-game purchases divisional packs for those gamers casino online after more game time and more teams. The game runs brilliantly and feels fresh with very impressive graphics, even though they’re a little cartoonish…this really helps the game retain the ‘over the top’ action from the classic version of NBA Jam. The realistic sound effects and running commentary give you just that little bit more satisfaction after pulling off a massive dunk and setting the net on fire or smashing the backboard! You have two options as far as controlling the game goes, but I found that using the D-Pad system over the touch gesture made a lot more sense with the pace of the game. Fulltime Review: EA sports have really nailed it with NBA JAM, the game is a classic in every sense with the arcade style nature of the game making it not just easy to get the hang of, but enjoyable for everyone, NBA fanatic or otherwise.